The GM 8.1L Vortec engine was the last of the GM series of big block engines. This V8 engine replaced the 7.4L Vortec as the high power option for the vehicles in which it was offered. The bore was kept the same for the 8.1L engine, but the stroke was lengthened which provided the extra displacement. Some other changes included new firing order, re-designed intake ports, and a conversion to metric threads throughout the engine, which no doubt had a major impact to tools required at the manufacturing plants as well as for mechanics who work on this engine. The 8.1 L Vortec was offered a variety of platforms for GMC and Chevrolet. The Chevy versions that used this engine were the Silverado, Suburban, Express, Avalanche, and Kodiak, while GMC offered the engine in the Sierra and Yukon XL. Other specialty versions included the Workhorse motorhomes, T98 armored vehicles, and the 26 foot U-haul truck. The Best Gas Engine for Towing? As mentioned, the 8.1L replaced the 7.4L Vortec in 2001. The 8.1 L was then produced until 2009 when it finally gave way to the small block 6.0 liter engine. This engine is no longer in production as the last was produced in 2009. Although there are some documented issues with this engine, it seems that most are very happy with the 8.1L. Many of these engines have made a significant number of miles, but the main reason to get an engine like this is for the power and towing capability. The ability of this engine handle heavy loads, particularly in combination with an Allison transmission is one of the things that makes this engine so popular. In fact, the primary complaint is the gas mileage, which most state is in the 8-10 mpg range, but that is to be expected with an 8.1 liter gasoline engine. 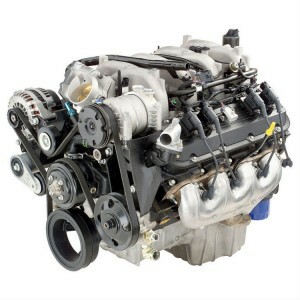 The power and torque of this engine varied widely depending on specific application, as is common with all engines used across a variety of platforms. The highest power rating was 340 horsepower, reached at 4200 RPM, while the highest peak torque ever reached was 455 lb-ft, achieved at 3200 RPM. The exact volume did vary slightly throughout the production of this engine, ranging from 8.095 liters to 8.128 liters, or about 494 cubic inches, created by slight changes to the cylinder head. The displacement was achieved with a bore of 4.25 inches, carried over from the 7.4 L engine, and a stroke of 4.37 inches, an increase of 0.37 inches in comparison to the 7.4 L that it replaced. This 8.1 L engine is made primarily of iron, using both a cast iron block and cylinder head. This engine used a conventional camshaft in the block with pushrods. There were 2 valves per cylinder, 1 intake and 1 exhaust to give a total of 16 valves for this V8 engine. This engine also used what was essentially a carryover electronic fuel injection system from the 7.4L. The 8.1L Vortec was the final big block gas engine from GM to date. This engine was primarily created for work purposes and was very popular among people who needed that kind of power. The massive size led to high fuel consumption, which was likely one of the key contributors to this engine being replaced by the small block 6.0 liter.